Welcome to Scuba Divers Red Sea based in the vibrant and cosmopolitan holiday resort of Sharm El Sheikh, at the southern tip of the Sinai Peninsula in Egypt. 1. Can anyone learn to dive? To be able to dive you need to be able to swim and satisfy the medical requirements set out in the PADI Medical Statement (click here). If you answer YES to any of the questions, you must seek the expert advice of a doctor specialising in dive medicine to obtain professional medical clearance to dive. 2. Can I hire equipment in resort? Yes, you can hire equipment in resort. Courses include equipment hire in the price of the course (except manuals, log books & certification). 3. I wear glasses / contact lenses. Can I learn to dive? Of course you can! Wearing glasses or contact lenses does NOT prevent you from learning to dive. However, you will need to be able to remove or flood your mask underwater and then clear it during the PADI Open Water Course. So as a beginner, contact lenses may be a hindrance as you could lose them while performing mask-clearing skills. Prescription masks, whereby prescription lenses are fitted to a regular mask can be purchased from many good dive shops. Depending on your eyesight, you may find you do not need a prescription mask at the outset as underwater everything is magnified 25 times with a regular non-prescription mask. 4. When is the best time to dive? Diving in the Red Sea is possible year round. However, if you hope to see some of the larger pelagic life, July and August are when you will find larger concentrations of barracuda, tuna and a variety of shark species. 5. What type of wetsuit do I need? 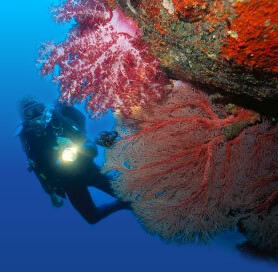 A 5mm wetsuit is usually recommended for diving the Red Sea. In winter, you will need a full wet suit but in the summer months a shorty will suffice. 6. What currency will I need for Egypt? The currency in Egypt is the Egyptian Pound (or LE). It is made up of 100 piasters. While you will need Egyptian Pounds for everyday expenses shopping, restaurants, etc., the Dive Centre prices all its activities in Euros. There are plenty of ATM machines in Sharm and a number in Dahab, too. Most hotels have foreign exchange facilities, though beware that the exchange rates may not be favourable. A number of the 4 and 5* hotels have banks and ATM machines inside the hotels. 7. What is the language of Egypt? The language spoken in Egypt is Arabic but English is spoken in all the tourist areas and many other European languages are spoken in Sharm and Dahab too e.g. Italian, Russian and German. 8. What is the electricity voltage and what type of sockets do they have in Egypt? The voltage is 220 and sockets are the 2 round pin European-type. It is advisable to bring adaptors for any electrical appliances. 9. Are there hospitals and dentists in Sharm and Dahab? For diving related incidents or emergencies there are hyperbaric chambers in both Sharm and Dahab staffed by doctors qualified in hyperbaric medicine. In Sharm there is an International Hospital and many European-standard dental practices. Holiday-makers are advised to take out travel insurance in their country of origin before travelling. 10. Is it safe to travel in South Sinai and other parts of Egypt? Crimes on the person (pick-pocketing, etc) are rare in Egypt. However, it is advisable to use the safes provided in the rooms in most hotels or safety deposit boxes in some hotel receptions and only take out what you need with you for the day. There have been terrorist incidents in South Sinai and other parts of Egypt in recent years but the tourism industry has fully recovered from these incidents and most visitors enjoy trouble-free stays in Egypt. If you are in any doubt, please contact the embassy or consulate for your origin country for the latest advice. 11. What is recommended for tipping / gratuities? Many restaurant and hotel bills include a service charge which helps to make up staff salaries which are traditionally very low compared to western salaries. So it is customary, if you have enjoyed your meal or experience, to leave a tip of between 10 12% on top of the bill. On liveaboards, it is usually customary to leave a tip for the crew and dive guides.